A DUI is a very serious charge that can result in substantial penalties if the case does not go in your favor. Having your license suspended is bad enough, but the myriad of fines, re-education programs, raising insurance rates, and possible jail time all make driving while under the influence of drugs or alcohol a charge to avoid having on your record. If you are pulled over by law enforcement and are facing possible DUI charges, it’s important to act in a way that optimizes your outcome. One major way to do this is to find a team of local lawyers here in Colorado that will work hard for you with the guidance and representation you need in the state. If you are looking for a team of experienced Greeley DUI lawyers, be sure to reach out to the Peek Goldstone, LLC for assistance. Our professional attorneys will work hard as problem solvers to try and achieve the most favorable outcome for your case. When you are facing a DUI arrest, it’s important to take a few steps to minimize your negative consequences. Police officers are trained to detect inebriation, and will likely work to gather evidence on the state of your sobriety if they become suspicious. While the list below is not a surefire way to win a DUI case, it can be very useful throughout litigation procedures. 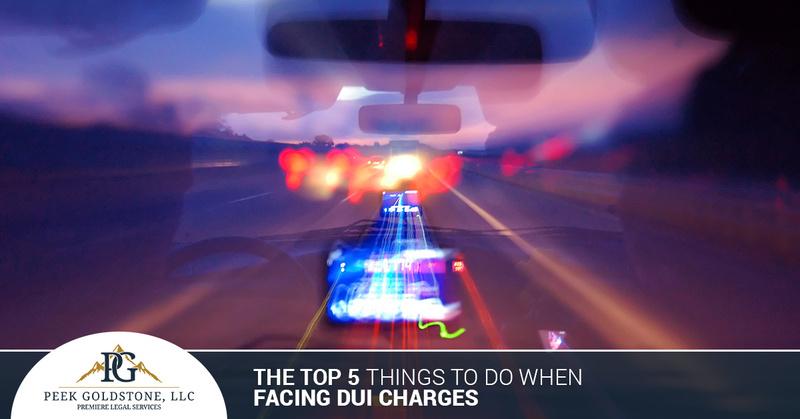 Many drivers hear about methods that can help them when trying to avoid DUI charges, and one of these suggestions includes minimizing chatter with law enforcement. This doesn’t, however, give you license to be impolite or rude. Be sure to be respectful at all times when interacting with officers, as doing otherwise will only impede your stop, and may increase the chances that you’ll do a roadside sobriety test. Most police officers will ask, “Have you been drinking this evening?” Many people admit that they have had one or two drinks at home. It is always advised not to come forward with this claim, as it may only be used as evidence against you. Legally, you are not obligated to respond and can reply that you were advised not to answer this specific inquiry. Once an officer is suspicious of your sobriety, they will begin to go through a list of tasks to establish intoxication. You will be asked to perform field tests, such as the field sobriety test, hand-eye coordination and comprehension testing, breathalyzer devices, and more. Remember that all of these techniques are crafted to measure how impaired you are. Sober drivers have been documented looking impaired during these tests, so be sure to minimize your participation. While you are not required to submit to any field sobriety tests, you will be legally required to submit a blood or breath test. If you refuse to take these tests, your license will automatically be suspended for one year, and your refusal may be used against you in the court process. Blood tests tend to be much more accurate, yet the time between an arrest and a hospital visit may affect the outcome of your DUI case. Breath tests are more readily available, but there are more conditions that can affect the test’s validity. When faced with these three choices, many clients fare the best when utilizing the blood method. If you are unsure as to how to proceed in your case, be sure to reach out to our law firm for assistance. Once you are assessed DUI charges, it’s essential to find experienced lawyers in town to guide you through this complex legal process and work to achieve a positive outcome for your unique case. Peek Goldstone, LLC is proud to be your team of DUI lawyers in Greeley, delivering comprehensive support and intense representation to protect your livelihood. Our team can work with you to create a staunch defense that can make all the difference in getting your life back on track. If you are facing criminal charges, be sure to contact us today to see how our Colorado law firm can help your case.